Westport’s epic All-Ireland Intermediate final win last Sunday has come at the start of what is set to be an exciting year for the town. The westerners made history in the capital by becoming the first Mayo side to take the Intermediate title. While the people of Westport relocated from Croagh Patrick to Croke Park for a few nervous hours, they returned late Sunday night to a town that is planning to mark its own historic milestone. On March 17 1767, John Browne, Baron Mount Eagle, placed a notice in Faulkner’s Journal announcing his ambitious vision. 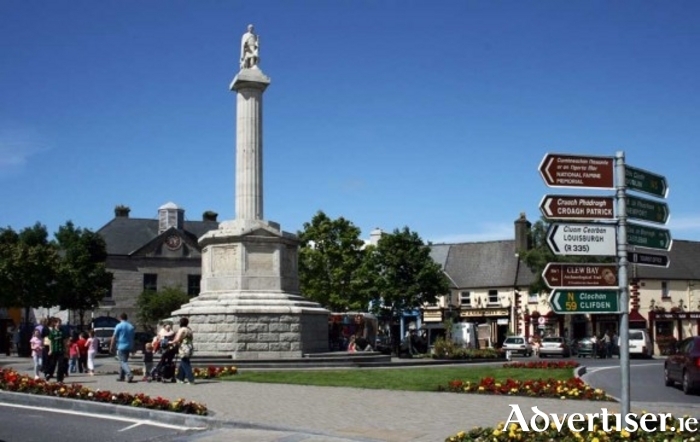 "A New Town is immediately to be built near the Old Town of Westport in the County of Mayo, according to Plans and Elevations & already fixed upon, consisting of a large and elegant Market house, situated in the centre of an Octagon area of 200 feet, and to be enclosed with Twelve large well finished slated Houses, together with three avenues for Streets of thirty slated Houses, and several very large Streets for [a] great number of thatched Houses and Cabins," so read part of Browne’s announcement. A spying St Patrick atop the Octagon monument points to the area’s early Christian history, but Browne’s ‘Old Town of Westport’ refers to the original settlement in the area that was very much alive in 1767. The O’Malley clan ruled the western sea corridors off the Mayo coast during the 16th century and, to secure their interests in the lanes of traffic, they built a castle known as Cathair na Mart (cathair being a stone fort ). Cathair na Mart became the name of the sizeable town of about 700 inhabitants that grew up near the castle, on the grounds of what is now Westport House. In a link to that past, Cathair na Mart survives as Westport’s modern Irish name. Edmond O’Maly and a castle, bawn, and barbican were recorded at Cahernemarte during the Strafford Inquisition of Mayo in the 1630s. The date of John Browne’s public notice, 1767, has been accepted as the year that the modern settlement of Westport was founded, which places us in the 250th anniversary of the coastal town. To celebrate the landmark occasion, a steering committee has put in place a year-long menu of festivities for the public. I recently caught up with the committee’s chairman, Councillor Christy Hyland, who explained what was planned. The celebrations will begin this St Patrick’s Day weekend in the recently refurbished, early 20th century Town Hall, which will host the hit theatre show Patrick. The weekend continues with a Westport 250 themed parade, street entertainment, and evening fireworks display. On May 13, an impressive harbourside air show will no doubt attract a large crowd and the fabulous 17th century Westport House, with its new lease of life, is also to play a part as a venue for an event in August. The committee’s online promotions invite the people of Mayo to ‘be proud to be a part of Westport 250’. Westport is an exciting place right now and it is certainly showing no signs of aging. So, make the most of what Westport has to offer, particularly in this anniversary year. Ich bin ein Covey.